1. I’m thinking of moving my blog over to self-hosting and not use blogspot.com (or wordpress.com). I have an idea for the domain name and am in the process of finding out if the same name is available in Twitter and Instagram. But now the problem is whether to use WordPress or Blogger for the self-hosted blog. Any advice? 2. For my birthday last year I received a Keurig coffee maker machine. I LOVE it and is the best thing ever. 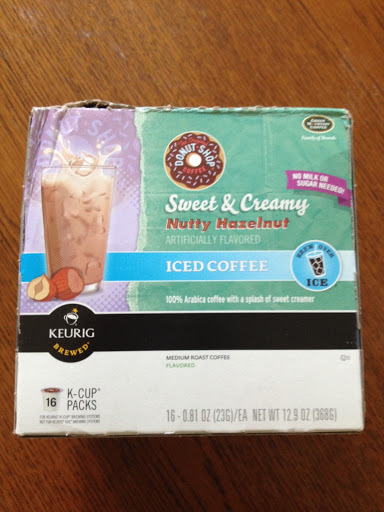 Recently I came across K-Cups to make iced coffee. It is so good and sweet. I found out today that Dunkin’ Donuts has something similar. I will definitely be making a trip there soon. 3. Thanks to Netflix I am finally watching “Grey’s Anatomy”. I remember some friends of mine were hooked on it but I never bothered watching it. Also, I watched the first season of “Scandal” in one evening (only 7 episodes) and am hooked. Unfortunately, season two is not available on Netflix but someone suggested HuluPlus. I checked and it is only $7.99 per month which is what I pay for Netflix. I might make a switch just to watch “Scandal”. Are you a fan of any of those shows? I've considered moving my blog to being self-hosted, too, but am not really sure if it is worth it!?!??! Please keep me posted on your thought process and decisions!!! Well, it depends on what you want. I just did not want to use the "blogspot" anymore and wanted a name that was a bit easier/better for others to remember and write. I made the same change in Instagram and Twitter so things are consistent now for me. It was really easy to do and am glad I made the change.